Originally published in 1982, this book emphasizes the continued significance and distinctiveness of rural settlement, while at the same time recognizing the great changes of recent decades. The early chapters review the field of rural study and trace the evolution of man-land relationships in the establishment of the traditional elements of rural settlement. Later chapters discuss the changes wrought by urbanisation, the industrialisation and commercialisation of agriculture, the growth of recreation and the expanding role of public policy. 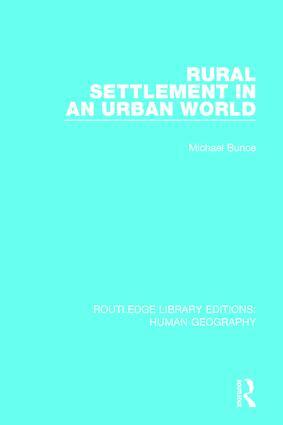 The book stresses the processes which underlie rural settlement structure and, consistent with its geographical bias, the functional and cultural foundations of settled landscapes. While the main emphasis is on Europe and North America, the diversity of expression of general trends in rural settlement is recognised by drawing upon examples from Africa, India, Latin America and South-East Asia.